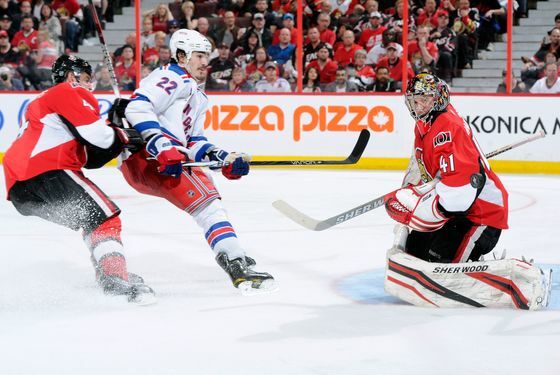 The Senators evened their opening-round series with the Rangers with a victory last Saturday night in a chippy Game 2. (How nasty did it get? Brendan Shanahan had to schedule not one, but two disciplinary hearings the next day.) John Tortorella's team bounced back with a 1-0 win in Game 3, thanks to Brian Boyle's third goal of the series and the heroics of Henrik Lundqvist. But Ottawa once again evened things with a win in Game 4 — their second overtime victory of the series — turning what had been a best-of-seven into a best-of-three. But what happened this week that didn't involve NHL debuts? The Knicks lost to Miami but beat Boston and New Jersey, and when the Bucks lost to Indiana last night, the Knicks clinched their second-straight playoff berth. The Yankees split with Minnesota, while the Mets lost two of three to Atlanta. We looked at the Jets' and Giants' 2012 schedules. Carmelo Anthony again topped out Knicks Power Rankings. We wondered if it's too soon to get excited about David Phelps. We looked at what kind of SNL host Eli Manning will be. And we spoke with Red Bulls goalie and Yonkers native Ryan Meara. That's it for now, but we'll be back Sunday morning with some thoughts on Game 5 of the Rangers-Senators series. Have a great weekend.